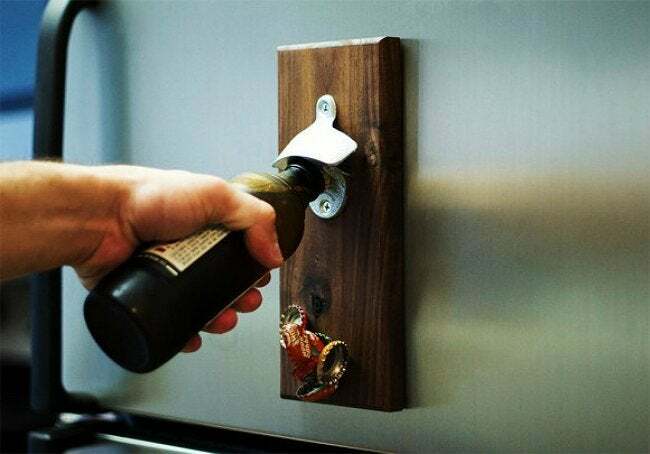 This no-mess bottle opener and cap catch is the best thing to happen to your summer socializing since beer bottle caps were patented in 1892! Hosting a summer party for family and friends is hardly a small task. Manning the grill, scrambling to set up seating, compiling the perfect playlist—pulling it all off can take some work. So the drinks—at the very least—should be refreshingly easy! With convenience in mind, Redditor ComradeNorgren made an easy add-on for the fridge that does everything but buy the beer for you. When you use it to pop off the top of your bottle, it will even catch the discarded cap so there’s no cleanup. To make the bottle opener’s base, cut a piece of wood about four inches wide and nine inches long. Then, pick the spot along the board where your caps should collect. Use a drill press to create a hole in the back side of the board to hold a rare-earth magnet. The hole should be deep enough so that only about 1/8 inch of wood will sit between the magnet and the popped caps. Place the magnet inside the hole. 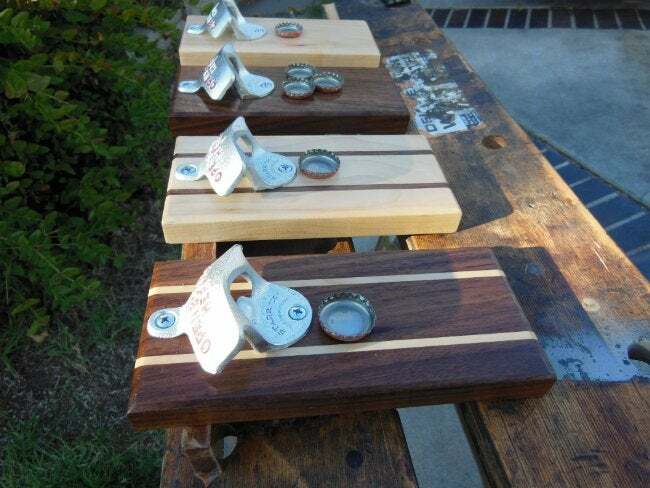 Continue by boring two shallow holes, one at the top and one at the bottom of the back side of your piece of wood, and fill these with rare-earth magnets to hold the device to the fridge. Secure all the magnets with wood glue or epoxy. Finally, using two screws, attach a stationary bottle opener toward the top of the front side of the board. For a warmer, more finished look, you can sand the wood and wipe the board down with tung oil. Because it’s mounted magnetically rather than screwed in, this is an ideal project for renters or homeowners who are trying to minimize wall damage. Plus, it allows you to place the opener right on the other side of the door from your chilled drinks. No more digging around—or forcing your guests to dig around—for a bottle opener. Cheers to that!